New Filmed by Bike Wares! We’ve got combo packs and special sale prices all weekend long. Don’t miss this rare opportunity to take home a little slice of bike movie love and support the festival. Check out locally made bike-themed items from more than 30 vendors! Most vendors are offering items that make great gifts. Shop local and support small businesses! You’ll be amazed at the creativity and ingenuity of some of these intriguing vendors! Former Filmed by Bike jurors will be on hand to answer all your burning bike movie questions! What’s the best way to get a movie accepted by the jury? What makes a great bike movie? What are some of the best bike movies Filmed by Bike has ever shown? What REALLY happens in that secret jury screening room? (they may not tell you, but you can certainly try asking! 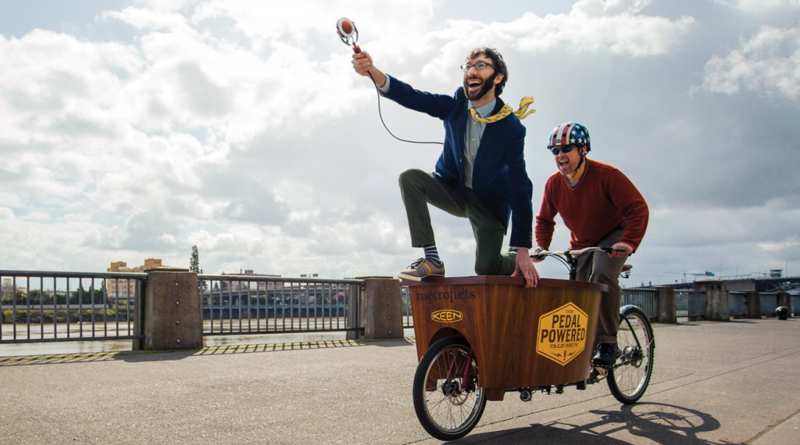 Also making a fantastic appearance is the Pedal Powered Talk Show bike/desk! Come see this incredible contraption in person.